October is right around the corner. 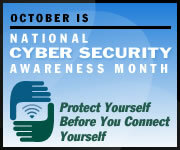 Are you ready for Cyber Security Awareness Month? Surely some of you have your annual activities planned and ready. For those of you who don't, take a minute to consider your options. If you have a Security Awareness Program in your place, you already have some great tools readily available and with just a little effort, you can get ready. If you haven't started planning yet, don't worry, there are plenty of free resources out there to help. One way to pass on the security wisdom is to wittle the "month" into a smaller time frame. Take a week, plan your activities, one per day. That makes only five smaller planning tasks. Here is an example of an easily acheivable plan. Day One: Monday - Send a IT Security email announcing the theme of the upcoming activities. Draw employees to your updated Intranet site during this week. Day Two: Tuesday - Poster Blitz. Make them as interesting and informative as your web page. Match the theme of your week or use freely downloadable copies. Have them printed at one of the copy stores or some even come printable on your own color laser printer. Supplement with a flyer or brochure, again be creative and provide solid helpful information. Day Three: Wednesday - Lunch and Learn. Announce a free 30-45 minute bring your lunch (or provide it if you have some budget) and hear a guest speaker. We all know someone who loves to talk about security, right? Giveaways and raffles are great way to draw a crowd. Use your imagination. Take reservations ahead of time if you need to plan for a room. Day Four: Thursday - Provide a security oriented puzzle or other fun security word search materials in all the break rooms and on the Intranet site. Set up a colorful security table and provide copies of your policies, brochures and free cookies. Draw attention with balloons. Day Five: Friday - Send another organizational email thanking everyone for their participation in the weeks activities and remind them where your website is located and that you are there all year to provide them the latest and greatest in security information. Voila...Cyber Security Awareness Week! Get started with StaySafeOnline.org. Educause.edu is geared toward higher education, but is a very good site with lots of free resources. For those of you already set for activities, send in your ideas and I'll pass them along. Fellow handler, Lenny, shared a student run information security competition called CSAW at NYU-Poly. There are even cash prizes and a trip to NY for the ceremony! Thanks to Drew for sharing this attention getting slogan. Think software developers and IT personnel ...."Practice Safe Hex"